On Saturday, April 7th, we had a double birthday bash for Ebby Lee & Nixon. (I know I'm a little behind. I'm so behind that blogger has changed since I've been gone??) Ebby Lee & Nix were SO excited!!! We had the birthday party at the clubhouse in G & M's neighborhood. It was the perfect spot! The room was big and the kiddos were fenced in the back...so there was no escaping! Everyone was being silly with their Easter buckets before the egg hunt. Got this off Ms. Sheaffer's blog. Looks like she was on a mission...ha! Tab had just opened the doors for the Easter egg hunt...and they're off! Ebby Lee thinks Mackey is the coolest thing ever! Love this picture! Think Whitney took it and she said that the girls did the posing ALL on their own...ha! Looks like Mr. Rawston found a treat! the Easter Bunny arrived!! (and Ms. Vicki-who I teach with) Ms. Vicki's son, Everett, agreed to be the Bunny for the party. I'm not so sure he knew what he was signing up for! ha! 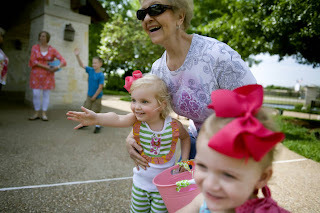 Ebby Lee, my Grandma (Ebby Lee's great-grandma), and sweet Presley...these girls were waving and smiling from a distance! Baby Maggie & Molly...ha! She wouldn't look up! Sweet Girls having a little birthday lunch. Present Time=CRAZINESS!! ha! Thanks so much to all my sweet girlfriends that were helping unwrap presents, take pictures, keep track of who got what, and who knows what else?? So thankful for my girls!! Check out Miss Priss' shoes! Fancy! This picture is out of order...but I LOVE it...Molly, Kensington, Ebby Lee, Mackey & Kirby fDon't know what happened to Poor Smith? It was an awesome day!!! Thank you SO much to everyone who came and made my kiddos birthday party so much fun! These pictures are out of order...but I don't know how to fix it! My grandparents (the kiddos great-grandparents) came all the way from MO to celebrate with us. Bless my Grandma's heart, I had her working hard this weekend!! She was such a big help!! Ebby Lee & Nix had a blast with them! Slaughter Family ready to party! G & M were there to celebrate! I got G & M up super early on Saturday morning to help us decorate for the party! So thankful for their help! T-Nonnie and Boo came too! I bet they were SO tired when they got back to Missouri! They helped me so much too! Don't know what I would have done if I wouldn't have had all that help! This girly was ready to party! So many pictures! They are all so sweet! Happy Birthday to your kiddos :). It was a fabulous day! !